Android and PC downloads are below. Goal: Defend the Star Babies using gem towers! Every round you dig up 5 gems, and choose one of them to keep. The picked gem will attack enemies. 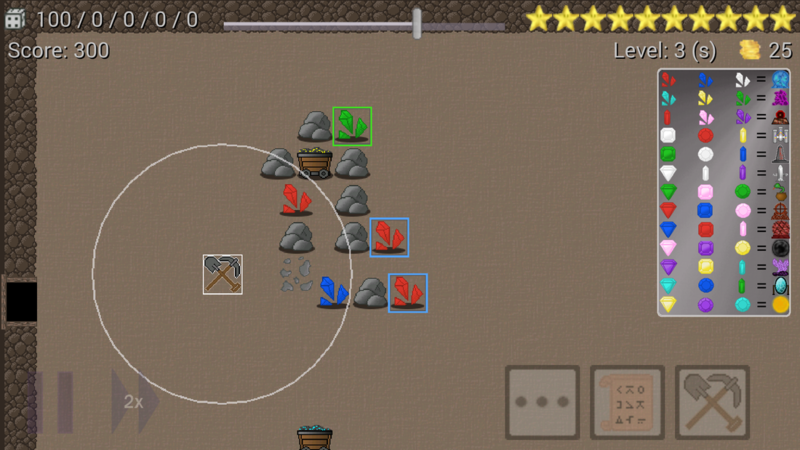 The gems not picked turn into rocks which the enemies have to move around. Create a twisting maze for the enemies to follow. They must visit each of the 4 mine carts in order. Use this to your advantage. Note: The last gem you picked may be moved around by dragging it. Rocks may also be removed. Two gems of the same type and color may be combined. Two red tier 1 gems combine into a tier 2 red gem. (Pictured above). You may also combine 4 gems of the same type / color. Combine 3 gems to create a special type of new gem tower. Tip: Tap a gem tower to see its abilities. There's buff auras, fields, status effects and more. See the full gem recipes listed to the right. As you defeat enemies you gain gold. Spend this gold to upgrade your chance level. Or use it to cast spells. Spells are powerful and may be cast by clicking the spell icon (mobile) or clicking the star babies (PC). 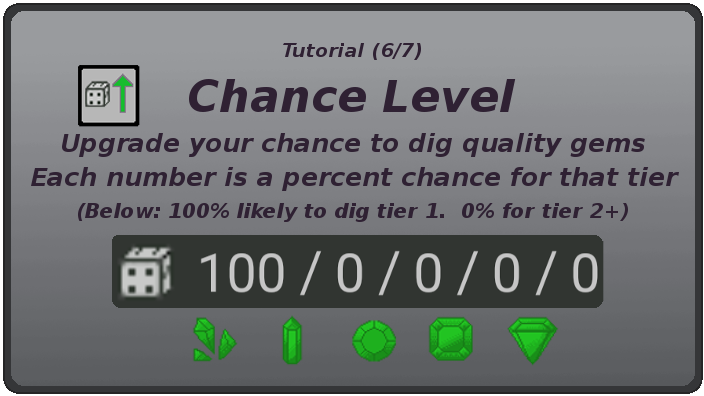 Increase your chance to dig up higher tier gems by buying chance level upgrades. Mobile supports zoom/pan. Pinch the screen or use the slider on top. The menu may be dragged. Drag the map to move around. The game saves automatically and you may load your most recent game. Stats can be viewed by tapping on the star babies. Click things to learn more about them. Thanks for playing! This was my first game and I had a lot of fun making it.